Trumps sändebud reser för att "freds"förhandla för 4700 gången, vad ska Abbas mutas med denna gången? En mycket tänkvärd artikel. Är inte första försöket att få Abbas och efterföljare att VILJA ha fred? Att sluta få enorma summor för att dikta upp skolböcker fulla av israelhat? Vilket gäller både Abbaskontrollerat land och Gaza - vars skolor domineras av Hamaslärare och enorma summor från Sverige. This is PEACE PROCESS number 4,699 – and Mahmoud Abbas and his PA/PLO are still the most rotten dirty scoundrels anywhere in the world. After writing about Otto Warmbier, a truly disturbing story from start to finish, I figured to give the world a rest. I’d watch baseball for an hour or two. But the Cincinnati Reds and even the Yankees keep losing. Can’t catch a break. Nothing to do but catch up on the news – and here in living color on Fox News is Jared Kushner, President Trump’s son-in-law and top advisor on a trip to Israel to “restart the PEACE PROCESS.,” the PEACE PROCESS, Dear Jared, that’s been going on since Harry met Sally, or back to when Isaac met Ishmael, or maybe even when Cain met Abel. By my count, this is PEACE PROCESS number 4,699 – and Mahmoud Abbas and his PA/PLO are still the most rotten dirty scoundrels anywhere in the world. I should not have to tell you this. You’re Jewish. Your heart is in the right place for Israel. I know this. I trust this. You’re frum, observant, and if you play a round of golf on the Sabbath now and then, who cares. Not me. Given all my sins, I’d be the last to judge. But about your effort to BRING BOTH SIDES TOGETHER, we need to talk. The papers say you’ve already met with Prime Minister Benjamin Netanyahu. Why not just leave it at that and go home? Bibi can tell you all you need to know. Even I can tell you all you need to know. But my television keeps telling me that you will also be meeting with Abbas, the man who personifies worldwide Islamic Terrorism with a smile and a shine. With him you intend to make peace? I should not have tell you about the Maalot Massacre, the Passover Massacre, the Munich Olympics Massacre, Klinghoffer and so much more in which he had a hand. Nor should I have to remind you that he stirs up incitement about the Temple Mount whenever business is slow. For sure you must know that he pays his people to murder Jews. You do know this, right? In case you forgot, he makes statues for his “martyrs,” those terrorists of his who commit bloody murder, and pays their families enormous sums. Why make peace where there is no war? You are needed in the Congo where thousands are being killed and millions driven homeless. Ditto the Philippines. This is unheard of anywhere else around the world. It is barbaric beyond human understanding. Please don’t tell me your PEACE PROCESS centers around a TWO STATE SOLUTION. I have already called it THE FINAL SOLUTION – and nobody disagrees. Then this: Suppose you “make peace” with Abbas and his Palestinian Authority, what separate deals are you prepared to make with Hamas and Hezbollah? Three more thoughts to consider as you along with David Friedman and Jason Greenblatt pursue this umpteenth PEACE PROCESS. 1. Why make peace where there is no war? You are needed in the Congo where thousands are being killed and millions driven homeless. Ditto the Philippines. Why is it always Israel that is everybody’s business? 2. Why do even the most well-meaning Jewish leaders get so bamboozled by the likes of Mahmoud Abbas that they end up doing his dirty work? Abe Foxman says that Israel should now be ready to “take risks for peace” because all three, Kushner, Friedman and Greenblatt attend shul and kiss the Western Wall. That is so very stupid. In other words, now that Donald Trump’s Israel advisors make up nearly a minyan, Bibi can be softened up to deal off more of Israel’s land, safety and security. 3. 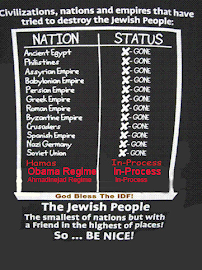 Only the Jews seek a “historic lasting peace.” The Arabs know better; that what we’ve got is as good as it gets. Only Jewish leaders dream on.